I swear by body scrubs. They not only keep your body skin soft and smooth but increase the blood circulation thereby keeping it healthy and rejuvenated. Though I always prefer homemade body scrubs but I was delighted to know that Gratiae provides organic body scrubs with really good ingredients especially sea salt. 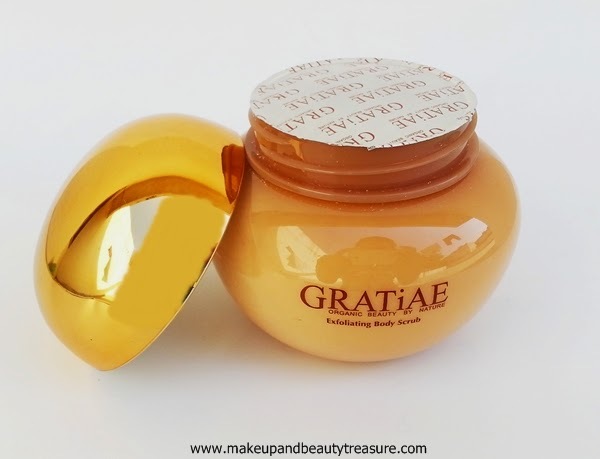 Today I am going to review Gratiae Exfoliating Salt Body Scrub (Apple, Green Tea and Ginger). 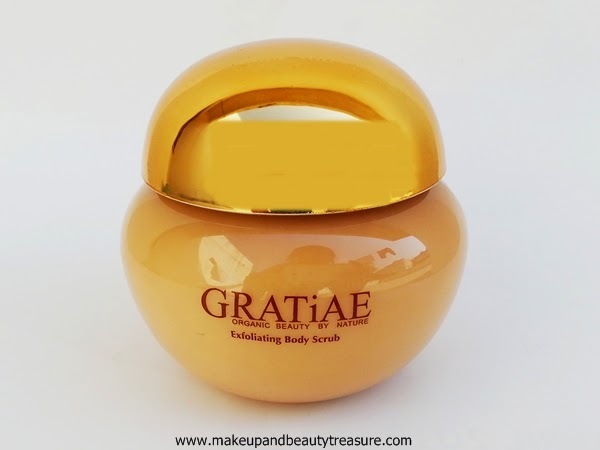 Gratiae Exfoliating Salt Body Scrub comes in a sturdy, light yellow plastic jar with a golden screw top lid. The packaging is super elegant and screams luxury. 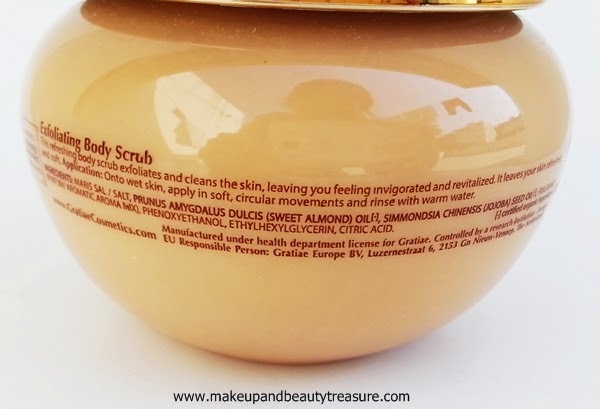 All the information is printed on the jar and there is a sticker stuck at the bottom that depicts the variant of the body scrub. The packaging is quite heavy so it might be difficult to carry it with you while traveling. As soon the lid is unscrewed, you will find that it is sealed with a foil to make sure that it is not opened or used. The scrub is white in color with a divine scent. The scent is a mix of apple, green tea and ginger that is very mild and feels amazing. 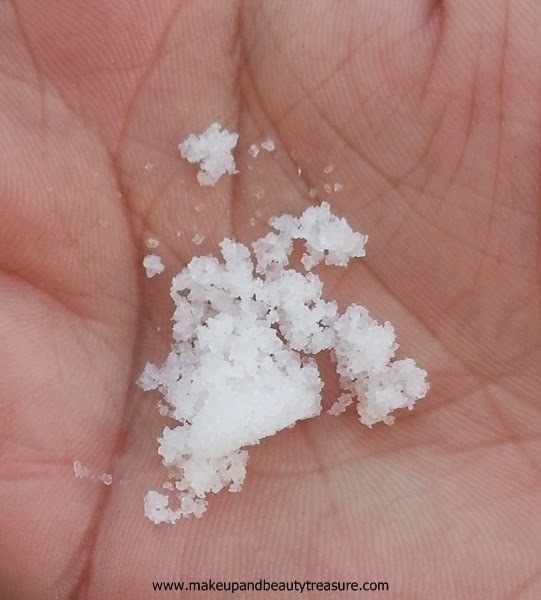 The texture of the body scrub is grainy just like tiny salt grains. You just need to pour a small amount of scrub onto your hands and apply it in gentle circular motions onto your damp skin. It feels really gentle and does not feel scratchy at all. I love the way it removes dead skin and polishes it. 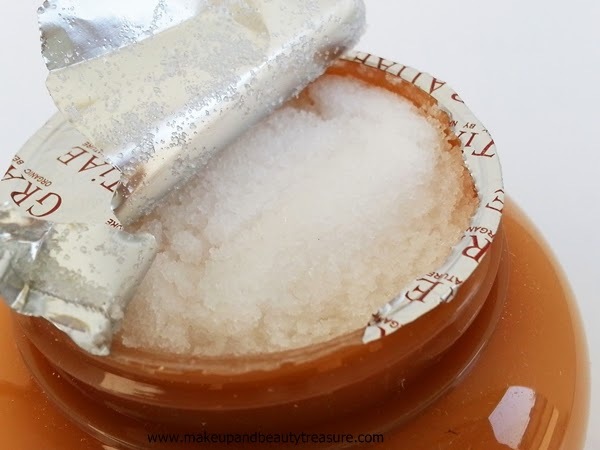 It does not tend to melt right away and gives you time to scrub away dead skin cells. It leaves my skin super soft, smooth, glowing and wonderfully polished. My skin has never felt this smooth and healthy before. It contains various oils like sweet almond oil, jojoba oil and citric acid that keeps skin super moisturized and bright and I do not feel the need to moisturize my skin though I do it anyway. It rinses away quickly and does not leave any oily residue behind. The scent lasts on my skin for a few hours though it is very mild. It works like a charm on drier parts like heels, elbows and knees. • The scrub particles are mild and do not scratch the skin. • The jar is slightly heavy to be able to carry in a bag. Gratiae Exfoliating Salt Body Scrub (Apple, Green Tea and Ginger) is one of the best organic body scrubs I have tried. It is not only gentle to the skin but makes it super soft, smooth and radiant. I love how soft and beautiful my skin looks after scrubbing. It contains all good ingredients like seal salt, sweet almond and jojoba oil and would work like a charm on every skin type. If you ready to splurge on skincare products then I would highly recommend it to you! 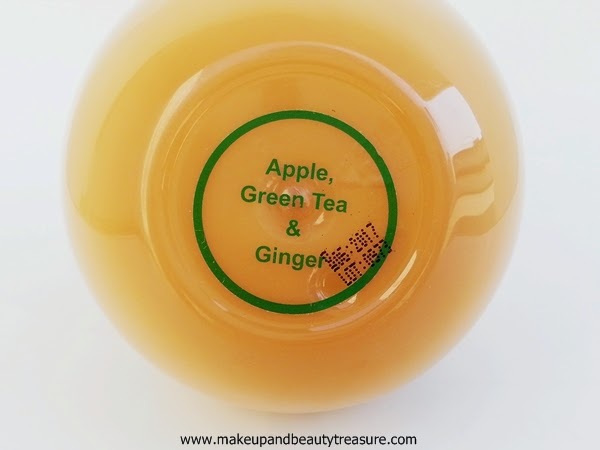 Have you tried Gratiae Exfoliating Salt Body Scrub (Apple, Green Tea and Ginger)? How was your experience? Share in the comments section below! Yeah purva it belongs to luxury skincare line!